5% off all orders placed on Sunday December 10th through Sunday 17th 2017. 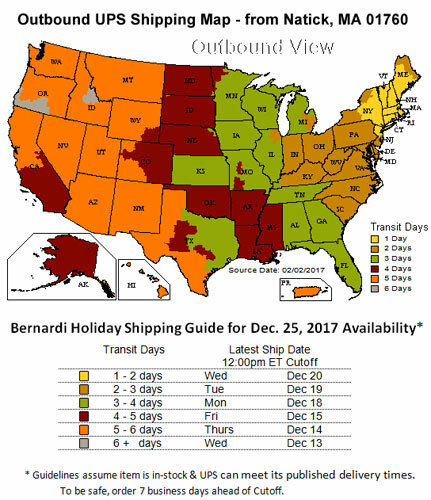 Please refer to ground shipping map below. All orders qualify for our Holiday Extended Return Period. Orders placed by 12pm EST with In-Stock items are typically shipped within 1 business day. Orders with special order parts are shipped when all parts are available. Orders with HAZMAT items such as touch-up paint, aerosols cannot be shipped Express Air. These orders may be delayed. Customers ordering items that are too large for FedEx Express will be contacted. Thank you for being a loyal Bernardi Customer.